Zeynep Çilek Çimen, “Beyaz Akrep” (“White Scorpion”), 130 x 130 cm, oil on canvas, 2019. Welcoming art lovers in Istanbul's Etiler district, O'Art brings together 23 contemporary artists working in various disciplines. Curated by Begüm Alkoçlar, O'Art's current exhibition "Şimdi" ("Now") offers a critical outlook on the effort to catch up with the contemporary in today's art. It's open to visitors until May 2. Daily Sabah conducted an interview with the curator, Begüm Alkoçlar, on the exhibition's contextual frame, contributing artists and the current world of art. Speaking on the reason behind the exhibition's title "Now," Alkoçlar said, "The exhibition represents now and today. We decided on 'Now' as we wanted to offer a selection focused on today's contemporary art." The moment you reach the exhibition hall, you are surrounded by artwork in white or shades of white and produced with various media. "If you consider the very beginning point of creation - which is the case for many branches of art - everything arises from an idea. This can be related to a white paper or canvas or any other material. With reference to white, which is the beginning point of making art, we prepared the exhibition," said Alkoçlar. Bringing together work produced in white and its tones also required great effort. While 80 percent of the works consist of the pieces produced beforehand, the remnants were ordered specifically for the show. "During the preparation process for the exhibition, I shared the text of the context with all the artists that I wanted to include in the exhibition and I wanted to learn if they already had white pieces. This was my modus operandi," she said. One of the most attention-grabbing points is that the show brought together pieces and artists that don't work with avant-garde concerns. "This is an issue which can be shown among the mostly disputed ones in the academy. People discuss the style of surface painting, the canvas painting or painture, whatever you call it, is dead. In fact, this debate arises every 50 years. I think '60s pop art was a great example of avant-garde and it will be so in today's world also. The avant-garde of the '60s was a result of the political and sociological structure. We also experience a sociological transformation for the time being. That will definitely affect art and transform it. Art is one of the very first stops of the action." Alkoçlar spoke on why she preferred working with artists who do not produce avant-garde projects: "An art piece made with avant-garde concerns imposes both the spectator and the artist. We, maybe, need material or a technique to overthrow that, to make a revolution. No one can expect it as avant-garde appalls, discomforts the spectator, and it was never welcomed throughout history. It was embraced much later. That was the common point of the avant-garde. We come across new initiatives also today, especially in the areas of kinetics and new media. I think we will come across avant-garde in these areas." Gizem Burcu Perçin, "Tamam" ("Alright'), 21 x 40 cm, embroidery on fabric, 2018. Begüm Alkoçlar, who has a degree in fine arts, practiced graphic design at the art faculty. "Then, I completed my M.A. in Art Direction. It is ordinary for curators to have a history of art degree. We all work to service an art branch that is suitable for us. This is what I appreciate for myself. Graphic design education feeds me a lot in curatorship. It prioritizes a composition with an image in one frame. I made great use of my graphic knowledge in space designing and the installation of the pieces." Bora Güney, one of the youngest artists of "Now," contributed to the exhibition with two pieces; one is a paper collage and the other is a Lego work. Graduating from the Faculty of Fine Arts at Istanbul Yeditepe University in 2017, he tried to "become an artist" in his own words in the two years after graduation. "The pieces exhibited here are parts of my graduation projects. They represent a fresh graduate who is full of hope and on the brink of embarking to realize himself in the world of art. I make multipartite white pieces. I don't have any media limitations. In general, I work on a single color. The point of inspiration for my white paperwork was daily routine. I live the same routine every day. So, people do. There's not any action in people's lives. We all have a target that needs quite tiny steps. The small paper pieces that constitute my work are multipartite rectangles. They all make up a square. That square represents the ideal that people strive for, as square stands as the symbol of balance and human-made perfection since the antique civilizations. A circle is also perfect, however, it belongs to the universe and nature. Human beings create corners and the square is the most perfect. All of us try to reach it. I cut all these papers folding them with my hands. The color white, on the other hand, represents hope and the good one. It is an optimistic piece, in fact." Bora Güney, "No:05," 75 x 75 cm, paper collage, 2018. His second piece on display is again a multilayered tableau consisting of Legos. Güney made it using toy blocks he played with in his childhood. "I studied the same concept with a different material in this one. I generally work assemblage and collage styles. Looking at them, I sometimes ponder about how close I am to the contemporary. In contemporary arts, everydayobjects, curtains, beds and fabrics are used. My works are much closer to postmodern aesthetics. My paperwork is closer to American minimalism while with the toy blocks I'm much closer to reality, or to a contemporary one," Güney explained. Another young artist at the show is Gizem Burcu Perçin. She is also a fresh graduate of the Plastic Arts Department at Istanbul Yeditepe University. "In fact, I was a student of management but I left the department challenging everyone around me. I wasn't busy with art before but I knew that I wanted it. I escaped home to receive art education in Italy. I also studied philosophy as a double major. Hence, I had the great opportunity to think on art. Today, art is quite an expendable and consumable form. I wanted to create something that we can touch and relate to the past. I wanted to concentrate on just one thing as the artwork becomes superficial when I work in multi-field." Perçin contributes to the exhibition with an embroidery piece. She extraordinarily presents the backside of the embroidery work to the spectator. "What I focused on was the feeling of delight. I wanted to share the same delight with the spectator and analyze that. I received intensive traditional education on arts in Italy. I didn't want to leave the joy that classical touch left on me and the spectator without getting totally disconnected from it." Speaking on Perçin's artwork, curator Alkoçlar said, "Burcu is quite successful in using the theory on the feeling of delight in her work. This is the reason lying behind why we are presenting the backside of the canvas. The joy is on the backside of the canvas. While art focuses on the genuine, society and people come together through tradition. That's why I find such strong integrity here. In addition, we have to appreciate her hand skills and art craft. There is also a self-confidence arising from the good command of philosophy. It's not ordinary for every artist to be able to leave a big impact with a small piece." Zeynep Çilek Çimen, one of the rising stars of the contemporary art scene, contributes to the exhibition with her work titled "Beyaz Akrep" ("White Scorpion"). 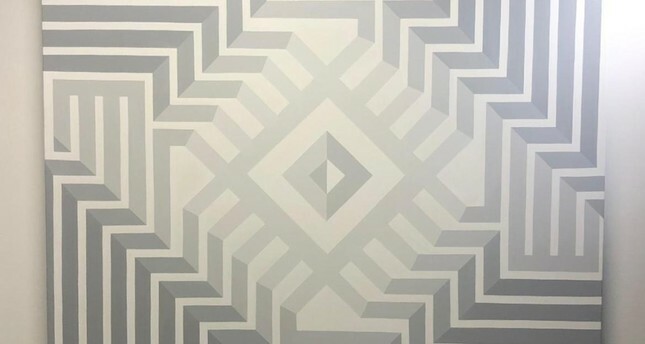 Harmonizing traditional Anatolian patterns with her contemporary style, the artist says of her work: "Anatolian people developed so many abstract patterns expressing themselves in an abstract way. It is enough to describe the sociological development of Anatolian people just by looking at the patterns. While I make you hear these thousand-year-old songs with my work today, I bring them to the present with my abstract interventions. Meticulously rendering Rumi patterns I was inspired by, the geometry of Anatolian Seljuks and the patterns on Anatolian rugs, I transpose them to the present. For Anatolian people, a scorpion symbolizes a state of caution, all the time lying in wait. What makes scorpions superior to its opponents is that it is always cautious and provides against danger. I painted my work white as this fearless side of the scorpion doesn't need any camouflage," she noted.